Our beautiful cherry-finished wood keepsake box is the perfect gift for any Irish Parent, Grandparent, Aunt, Uncle or friend. This one of a kind Celtic Gift is sure to make them feel full of Celtic pride. Your Personalized Black Keepsake Box measures 8"L x 6"W x 2"H and is perfect for holding your little treasures, such as small photos, old cards and letters. Includes FREE Personalization! 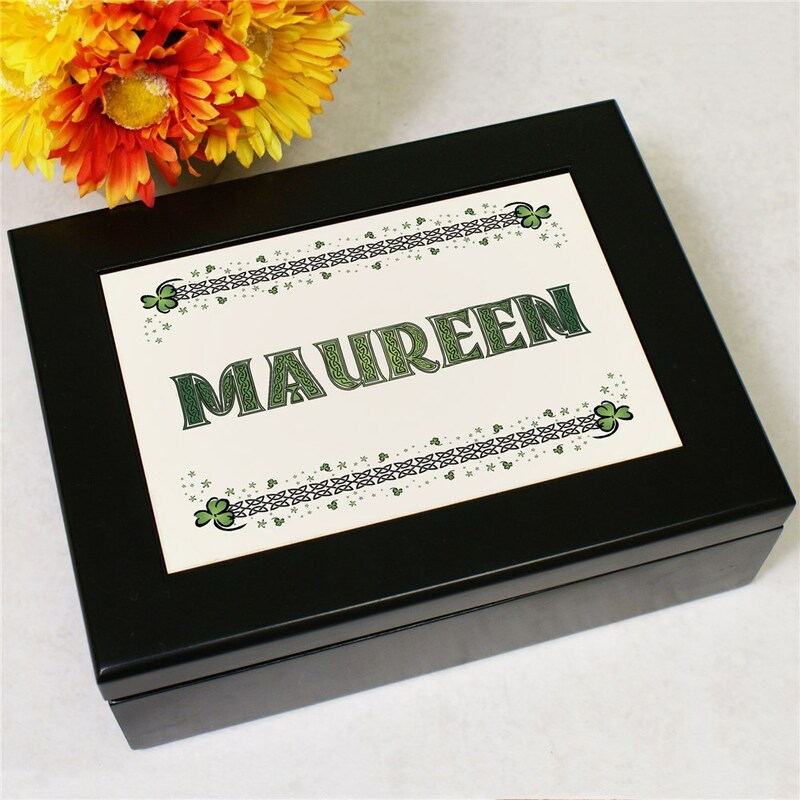 Personalize this Celtic Keepsake Box with any name. I bought this as a birthday gift for my sister. She loves it! It's just the right size and the quality is very nice. The box was more beautiful than the picture online gives it credit. The item description did not say what the top part (white part) was made out of, so I was a little concerned that it would look cheap. But it didn't. The lettering is awesome and the white is like ceramic, very elegant. After the item was completed the shipping was quick, which I appreciated. Additional Details Giftsforyounow has a large assortment of Irish Pride shirts, including our cheeky Personalized Irish Boxer Shorts, & our Irish Drinking Team shirt. We also have many great irish baby gifts, irish gifts for grandma & lots of Irish Keepsakes. Our Irish blessing Cross is a very popular Housewarming gift. For everything Irish & for all of your Personalized St. Patrick's Day gift needs, shop at Gifts For You.